Hull strawberries and juice using a food juicer. Discard the pulp. You should have approximately 1 quart of clear juice. Add sugar and salt to juice and stir well until it’s all dissolved. Transfer juice to a non-reactive shallow pan (third pan) and place in freezer. Scrape ice with a fork every 30 minutes to form crystals. There shouldn’t be any liquid left at the bottom of the pan. In the meantime, shell green almonds and discard shells. Remove yellowish skin covering the almonds. If almond kernels are milky white, place in a container filled with iced acidulated water and reserve. If the almond kernels are not yet developed and appear translucent, you might want to consider shaving the whole green almond, including the green shell, thinly using a mandoline. Slice fennel bulbs lengthwise, on the wider side, using a mandoline and soak in iced water to soak and rid of any dirt or sand. Remove sliced fennel from water and place in large vacuum pouch. Add fresh coriander sprigs, a pinch of salt, a pinch of sugar, and 1/4 cup cold water. Cryovac on the highest vacuum setting. Set aside for a few minutes. Open vacuum pouch with scissors and place sliced fennel on a kitchen towel or a paper towel to drain. Discard coriander sprigs and liquid from bag. Remove almond kernels from iced water and drain on same towel as fennel. To serve, scrape the green strawberry ice one last time to fluff and spoon about 3 tablespoon in a well chilled bowl or glass. 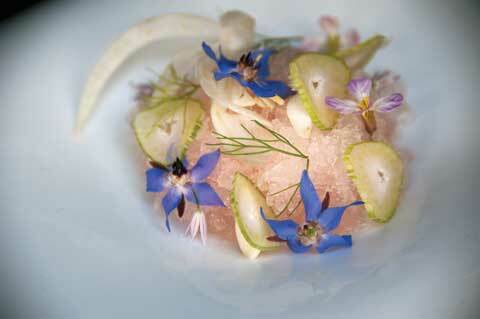 Arrange two slices of the compressed fennel on the green strawberry ice and arrange 3 green almonds on the ice. Drizzle 4 to 5 drops of almond oil on the ice, fennel and almonds. Garnish with bronze fennel or fennel fronds.